It’s a question I’m now asked all the time now, usually by people with lots of kind, knowing sympathy in their eyes. They see My Loved One, weakened by the ever-heavier weight of Ms Alzheimer’s on his back, while hearing me obliged to talk to him as if he’s a biddable three year old. And they wonder. The answer is that in many ways I’m absolutely fine. I’m blessed with excellent health and a brain which seems to be locked in overdrive. If people push me I confide that I have a bit of arthritis (?) in my left thumb which hurts so I wear a thumb splint to play the violin and try to avoid doing up too many buttons on my clothes or MLO’s – hardly a major issue. And it’s important that I stay that way. It’s the crashing aircraft principle: fit your own oxygen mask before helping anyone else. If you’re not fit (or breathing!) you won’t be any use to anybody. So I eat healthily, watch my weight, try to build exercise into daily life, go very easy on booze and of course I don’t smoke. There are, however, two negative factors which are beyond my control and not, I suspect doing me any good at all. One is sleep and the other is stress. MLO now needs a great deal of 24/7 help. I have to shower him at night (a sort of hosing down operation) assist with drying, and then physically put him into his nightclothes before easing him into bed – and of course we do the whole operation in reverse each morning including another very necessary shower. It means that I can’t even start to get myself into the bath etc at night until about 45 minutes after I start to help him. By the time I eventually get into bed he’s probably been asleep for a while but, typically wakes up five minutes after I’ve put the light out and has to be helped out to the bathroom – a routine we sometimes go through four or five times in a single night and on a bad night several times in a single hour. Twice last week I got less than four hours sleep – and then only in short bursts. MLO gets very confused in the night too and will wake up and talk a lot. He wants answers and I do try but most of what he’s saying is incoherent and dream-related so whatever it is, it isn’t a conversation. But it means I’m awake. Sometimes I give up, get up and do some work in my office next door in the hopes that he’ll settle. If he stirs I can still hear him. I could sleep in another room of course, except that I can’t. There’s no way he can just be left to get on with it. Half the time he doesn’t know what building we’re in or where any of the rooms are. I wouldn’t be able to relax for a second if I shut myself away in another part of the house. It would be like parking a baby out of earshot. Not on. So if you meet me out – at the theatre, say, reviewing ( while a carer I’ve paid “mansits” at home) and you think I look hollow-eyed with tiredness, then you’re right. Lack of sleep – and the stress it causes – is said to be very bad for your health and if I read another article telling me that, I think I shall scream. In my situation you can’t manage the number of hours you get. I’m happy to allow 7 or 8 hours but it’s most unlikely that Ms A will allow me to sleep for most of that time. Roll on the three days next month when I’m going to stay with a friend in Yorkshire while our elder son takes over at home. And it’s the toll that this constant tiredness takes on the carer which isn’t generally recognised by the decision makers although our GP quizzed me about it only last week when I took MLO for a routine “condition and medication review”. And people I know personally, or whom I’ve got to know virtually or actually through these blogs are very understanding. It is, however, in the government’s economic interests to keep people like me going for as long as humanly possible. If I weren’t looking after him day and night, someone else would have to and that would cost the country a great deal of money. Alzheimer’s patients are entitled to “free” (ie paid for by life long tax payers like us) care via the NHS Continuing Home Care service, providing that their health problems have no other underlying cause. In practice, of course, provision is very patchy. I was delighted to pick up a little video of Derek Thomas MP for St Ives, West Cornwall and the Isles of Scilly last week addressing parliament about the plight of people like me. He has clearly met lots of us and spoke with real authority in support of Alzheimer’s Society’s new campaign “Fix Dementia Care” following its report earlier this year. Want to help? Well, it’s worth lobbying MPs who aren’t already on the support list to sign up to it. https://www.alzheimers.org.uk/our-campaigns/fix-dementia-care. 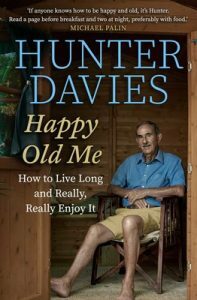 On a happier, but related, note I am uplifted and cheered by Hunter Davies’s joyous new book Happy Old Me (Simon & Schuster UK, 2019) which I’ve gobbled in the last few days. Like us, he and his late wife – respected novelist Margaret Forster – had been together since their teens and had been married 55 years when cancer got her in 2016. He is delighted to be alive and reasonably well at 83, determined (like me) not to retire and busy carving out an enjoyable life for himself. It’s one of the most encouraging, positive books I’ve read for ages and all couched in his characteristically insouciant, self-deprecating style. Thank you, Hunter, for reminding me that there IS a light at the end of the darkest possible tunnel and that it IS possible to come through battered but generally pretty OK.